On the trip home, Edward took Bella’s silence to mean that she was afraid and angry for what Edward was putting her though. It wasn’t until they arrived in Forks and Edward could hear Rosalie’s thoughts that he understood that Bella intended to keep the baby. Edward stayed with Bella as Carlisle examined her and confirmed the pregnancy. He also remained insistent that the pregnancy be terminated in order to save Bella’s life, which caused a rift between Edward and Bella as well as the entire Cullen family. Edward Cullen (born Edward Anthony Masen) was born on June 20, 1901, in Chicago, Illinois, and is frozen in his 17-year-old body. 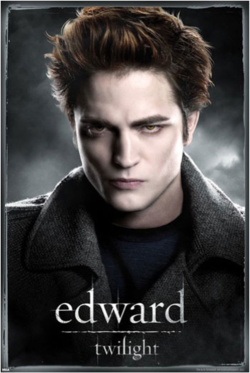 While dying of the Spanish influenza, he was changed into a vampire by Dr. Carlisle Cullen because Edward’s dying mother, Elizabeth, begged him to save Edward. Edward only drinks animal blood and has the special ability to read minds, with the exception of Bella Swan’s. He falls in love with Bella soon after she arrives in Forks. Edward knows that he could kill Bella easily, a fact that torments him so much that, in the book New Moon, he decides to leave Forks with his family so they won’t be able to hurt her. He returns because he realizes he cannot live without her. Edward marries Bella in Breaking Dawn and they have a daughter, Renesmee.